This past weekend was mum and dad’s thirtieth anniversary. I decided to treat them to a wholesome lunch. Also it had been a while since I had cooked and since I was craving something flavourful so I thought it would be a good idea to make a Malaysian Laska. I still remember the Malaysian Laska that I had in New York at Cafetasia – it’s akin to a party of flavours. 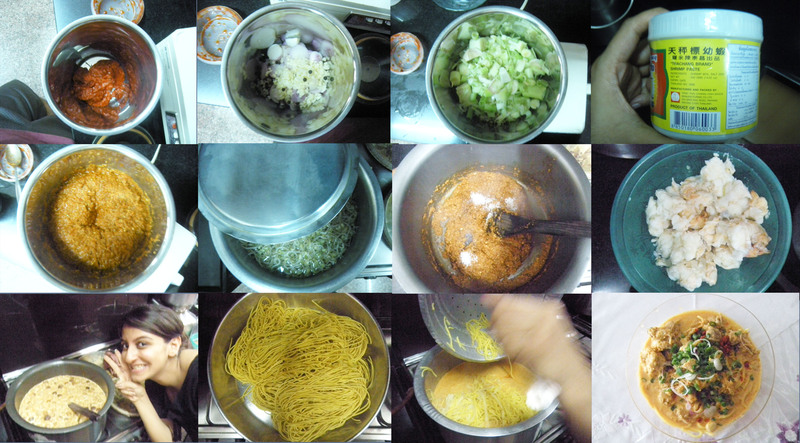 My sister and mom both went to Crawford Market a day before and helped me acquire the ingredients. I improvised on the recipe that I found on rasamalaysia.com. The recipe asked to add a shrimp paste – which gave off a foul smell at first. On further stirring the spices that foul smell subsided and therapeutic aroma of lemon grass arose. As I was cooking my mom peered over my shoulder and read that a key ingredient mentioned was pig’s blood. Pork and or consumption of pig in any other form is taboo in my family so that certainly gave her a scare. We made our Laska devoid of pig’s blood and therefore you can see the difference in colour. In taste the Laksa was pretty close to the one in New York but the curried soup was thicker than it should have been. This time around unlike the Rendang there was plenty of Laska left over for dinner the next night! This entry was posted in Food, Travel and tagged Cooking, Food, Malaysian Laska, Recipe. Bookmark the permalink. Most certainly will! 🙂 I have yet to cook for Amrita as well!